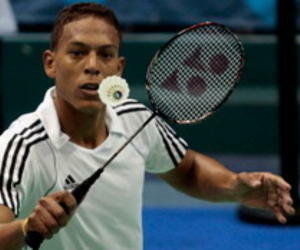 Cuba’s Osleni Guerrero became the first Cuban to win a Pan American Badminton Championship title, while Canada added 3 golds to their mixed team title. Osleni Guerrero of Cuba has made a habit of beating Sattawat Pongnairat of the United States in the last year or so but today he finally made it count in a gold medal final. Unlike last year in Peru or even earlier this month in Brazil, he wasn’t facing off against the American for the right to play a higher-ranked Asian in the final. This time, Guerrero had already marched through the entire men’s singles field, spending right around half an hour in each of his appearances on the sweltering courts of the Palacio de los Deportes Virgilio Travieso Soto in Santo Domingo, Dominican Republic, by th time he was to play Pongnairat for the Pan Am Men’s Singles Badminton title. The two men split the first two games before the Cuban took control and nailed the victory with a 21-10 finish in the decider. Canadian brothers Derrick and Toby Ng did not team up as they had in the mixed team event but nonetheless, they were each able to stamp their name on an additional title in the individual event. Toby took his first international title with Olympic women’s doubles semi-finalist Alex Bruce. Ng, who got as high as world #16 with former partner Grace Gao, had previously only played in two international events in Canada with Bruce. They had a little trouble in the second game from Americans Howard Shu and Eva Lee but managed to finish it off in two. 2012 double champion Derrick Ng was content playing in just one discipline this year. He and Adrian Liu (pictured) took their second men’s doubles title in a row by beating compatriots Nyl Yakura and Kevin Li in two quick ones. In contrast Kevin Li’s misfortune – Canada’s other owner of that family name, Michelle Li (pictured) – got back to the winning ways that saw her take two golds at the Pan Am Games two years ago. She ran roughshod over the women’s signles field and disposed of Jamie Subandhi in a 25-minute final to bag the title. Alex Bruce was unable to defend her women’s doubles title with Phyllis Chan, however. Eva Lee had a chance for payback when she beat Bruce on the second opportunity, playing with partner of three years Paula Lynn Obanana. Incidentally, the women’s doubles final was the very contest that was not played in Wednesday’s team final due to Canada having already won the tie 3-1. Many of the competitors from the Pan Am Championships are now gearing up for the U.S.A. International Challenge next week while a pair of Canadians are heading west to the Korea Grand Prix Gold.